The detachment or tearing of the retina in the human eye as a result of a collision is a phenomenon that occurs very often. The project was aimed at understanding the actual processes of dynamic deformation taking place in the human eye when subjected to blunt impact. For this project an FEA model was developed in MSC’s Dytran software starting from 3D measurements of real human eyes. The results of the model were then compared to measurements with respect to the deformation at different times and to the residual velocity of the projectile during the rebound phase. Over 60% of all eye injuries are caused by blunt impact, i.e. impacts with objects of various kinds that do not cause a perforation of the globe. Based on evidence of a patient who, despite having undergone the removal of the vitreous, had a clear macular hole resulting from a blunt impact, it was decided to investigate this phenomenon in more detail in order to validate the various hypotheses of damaging mechanism with the help of a MSC Dytran simulation. 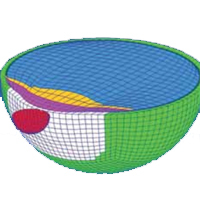 The computational model of the ocular globe was generated starting from an average size human eye represented with the help of the code MSC Dytran. 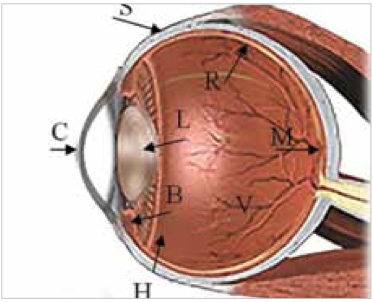 The preliminary results of the project indicate that the laceration of the retina mainly occurs due to the tension resulting from the reflection of compression waves in the moments immediately following the impact, and not necessarily due to the deformation of the whole eye. The availability of a reliable and validated model for the simulation enabled the research team to understand in detail the pathogenesis of the blunt impact phenomenon, which is particularly difficult to reproduce in a controlled and instrumented manner through physical tests in the laboratory. Practical applications of this study are to be found especially in the military industry, for example in the design of advanced security systems for personnel and for helicopter pilots in the event of a crash landing.